The yield curve of the US treasuries is becoming flatter. Short-term rates are rising because of the Fed’s decision to increase its federal funds rate. However, the long-term rates stayed unchanged despite more restrictive monetary policies. The Fed is unable to move the long-term rates. As of August 9, 2017, the Federal Reserve had about $2.5 trillion of the US Treasury securities (Federal Reserve Statistical Release). The Fed has been reinvesting maturing debt by buying new securities at the auction. Since 2015, the amount of the US Treasury securities held by the Fed remained unchanged at about $2.5 trillion. The Fed has indicated that it may allow treasuries to mature without reinvesting proceeds into new securities. This is the Fed’s exit strategy, the way to unwind its balance sheet. As of today, the Fed continues to reinvest all proceeds from maturing treasuries. As of July 31, 2017, the total amount of the US Treasury securities outstanding was about $14 trillion (Treasury Direct). The Treasury department continues to supply the market with the new debt. For the last 12 months the US Treasury Department has issued $2.3 trillion bonds and notes (Sifma, August 12, 2017). 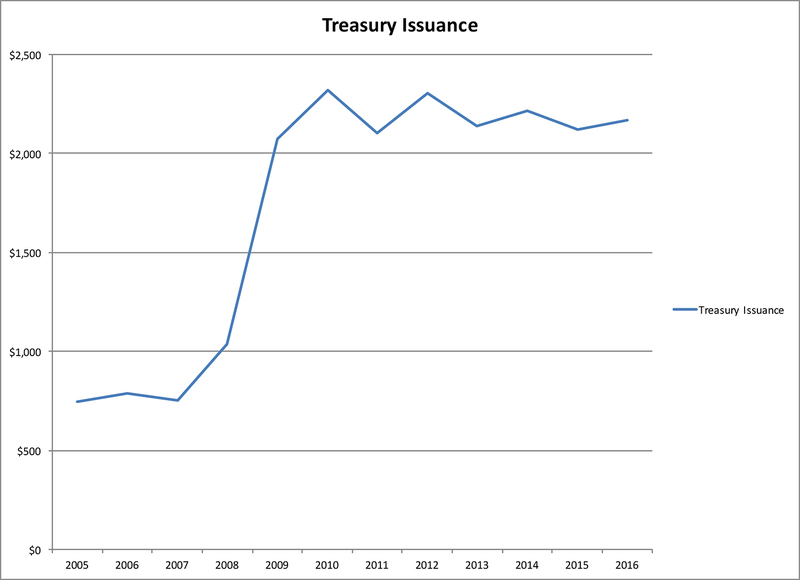 For the last eight years, the US Treasury Department has been issuing more than $2 trillion worth of securities every year (see chart 1). Before the year-end, the Fed is expected to increase its short-term interest rate one more time. In 2018, three more increases are expected. Let’s assume these expectations are correct and the Fed raises its short-term rate by 0.25% four more times. This will increase short-term yield by 1% from 1%-1.25% to 2%-2.25% by the end of 2018. If long-term rates do not change, the yield curve will be almost flat. From the chart 2, you can see that the Fed can influence mostly short-term rates, securities that mature in the next three years. In comparison to the total amount of government debt outstanding, the Fed owns about 17.5% of all US Treasury debt. It is a significant among of treasuries owned by one investor. Since most of the debt is short and intermediate term, the Fed can influence those rates. The Fed has about $1.5 trillion of US Treasury securities maturing within the next 5 years and $1 trillion of US Treasury securities maturing after 5 years. 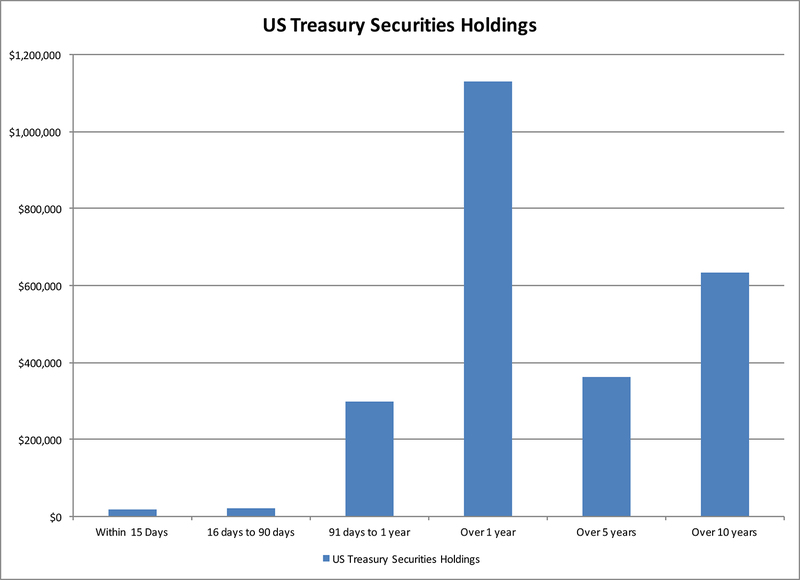 The graph bellow shows the maturity distribution of all US Treasury securities held by the Fed as of August 9, 2017 (see chart 3). The Fed has signaled its desire to unwind the balance sheet, which was enough to push short term rates higher. 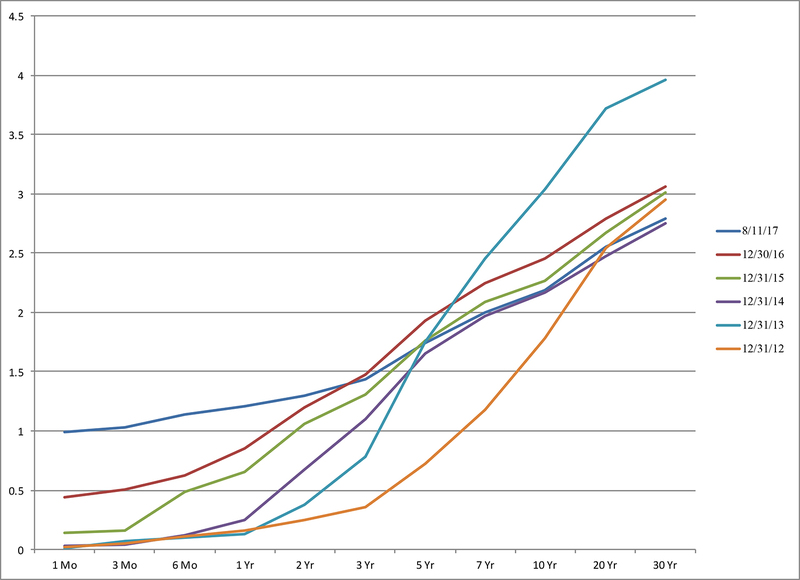 As you can see from the chart 3, the Fed can influence mostly the short-term structure of the yield curve. The yield curve is likely to continue to flatten. The Fed has a strong control over the short term rates through its FOMC policies: setting the federal funds rate and by purchasing US treasuries. The long-term yields are out of the Fed’s control. This paper was written as an opinion only. The data is not guaranteed to be accurate or complete. Please consult with your financial advisor before making an investment decision. Investing in long-term bonds exposes investors to a potential significant downside losses if interest rates do rise or credit rating gets downgraded.